Toyota and the Québec Government share a common goal – to reduce the carbon emissions of vehicles driven by Québec drivers – and they are collaborating to make this a reality. During a meeting with Energy Minister Pierre Arcand today, the Chairman of Toyota Motor Corporation, Takeshi Uchiyamada, shared how Toyota plans to work closely with the Québec government to achieve this goal. 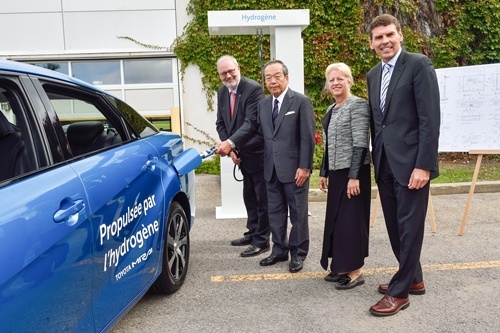 At an event in Brossard today, Chairman Uchiyamada announced that Toyota Canada’s first hydrogen fueling and service facility will be built at its Québec zone office as a first step in the development of hydrogen fueling infrastructure in the province. Both Toyota and the Québec government are dedicated to continue providing solutions for carbon emissions reduction in the province.